The scientists of ASU Faculty of Physics and Technology developed a system for voice falsification detection in biometric identification. Commercial market has a strong demand for developments in biometric personality recognition. Currently, these technologies are being actively used for authorization on computers and mobile devices. It is a convenient and fast way to access the system without typing a password. “A person can be identified by different biometric parameters such as fingerprints, iris, handwriting. We work with the system that recognizes a person by voice. As practice shows, there is nothing absolutely secure, and voice identification, in spite of its attractiveness, is also vulnerable, as there are modern methods of speech synthesis and transformation, with the help of which the frauds can falsify almost any voice, present themselves as some other person and get into the system. 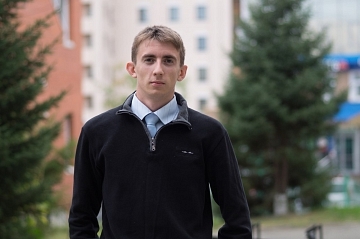 Our development can detect such voice falsifications,” explained student of Faculty of Physics and Technology Yakov Filin, who works on this project under the supervision of Assistant Professor of the Department of Applied Physics, Electronics and Information Security Andrey L. Lependin. The development was produced by ASU scientists in May 2016. It is an electronic program that can be installed on desktop computers and mobile phones. The platform uses unique voice characteristics for identity authentication regardless of the chosen remote access method (through the phone, web-resources, specialized smartphone applications and so on). “Our system works on the basis of Gaussian mixture method, which helps to create specific person’s voice model. We have a large voice database, with the aid of which we have created our voice falsification detection system,” clarified Yakov. The system is now being completed and improved with the use of new voice falsification detection methods. On 20–23 September this project will be presented among other student’s research works at the 2nd All-Russian Scientific Forum of Young Scientists “Science of the Future Is Youth Science”.